"Open House ; Craft show and Antique Car show"
10'x10' - $50 - Returning Vendors. $100.00 All vendors after April 1. This includes your ticket for lunch. **DFWCS Special Update** Booths are $25 until 4/25. Applications are available here and are due by April 25, 2019. For more information, contact their event coordinator at jlansing13@yahoo.com / 817.266.9250. "A community event featuring all kinds of businesses including boutiques, hand-made crafts, services and organizations. It features a Taste of Midlothian, food trucks and exciting DIY experiences. 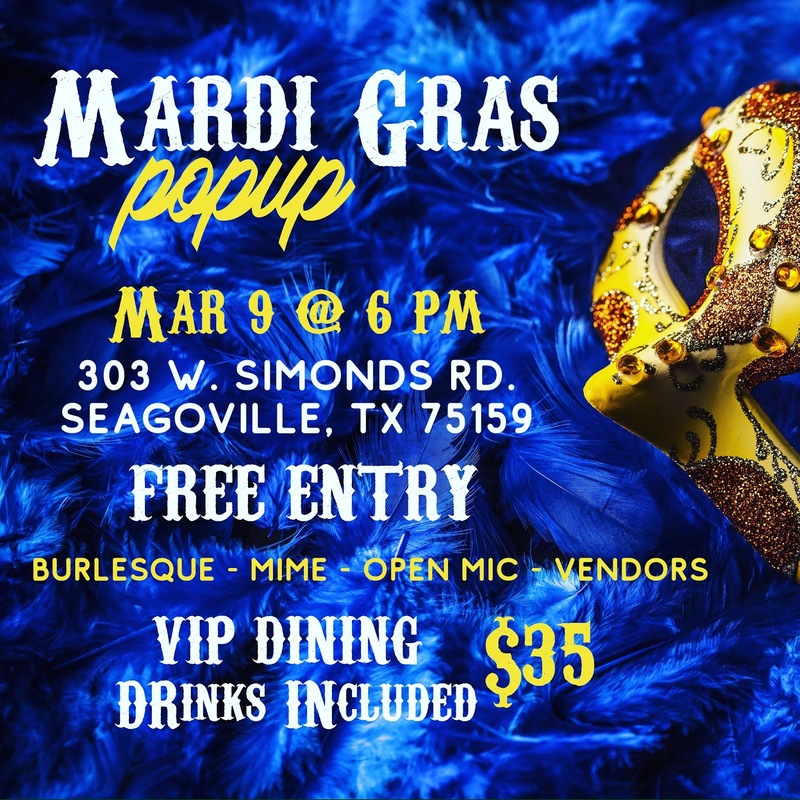 This event connects businesses to the community." Booths are $15 for a space big enough for a 6 ft. table. Tables are not provided, but chairs will be. Electricity available by request but an extension cord should be brought with you. Applications are available here and are due by March 08, 2019. For more information, visit their website or contact their event coordinator at Iphigeniahospitality@gmail.com / 817-716-0226. 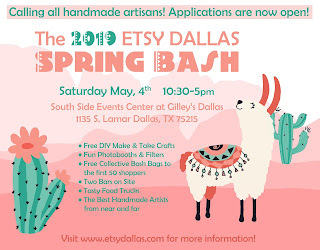 "Etsy Dallas' Spring Bash, a premier handmade shopping event and party, will showcase the very best in local handmade apparel, bags, jewelry, home décor, accessories, art, pottery and more. 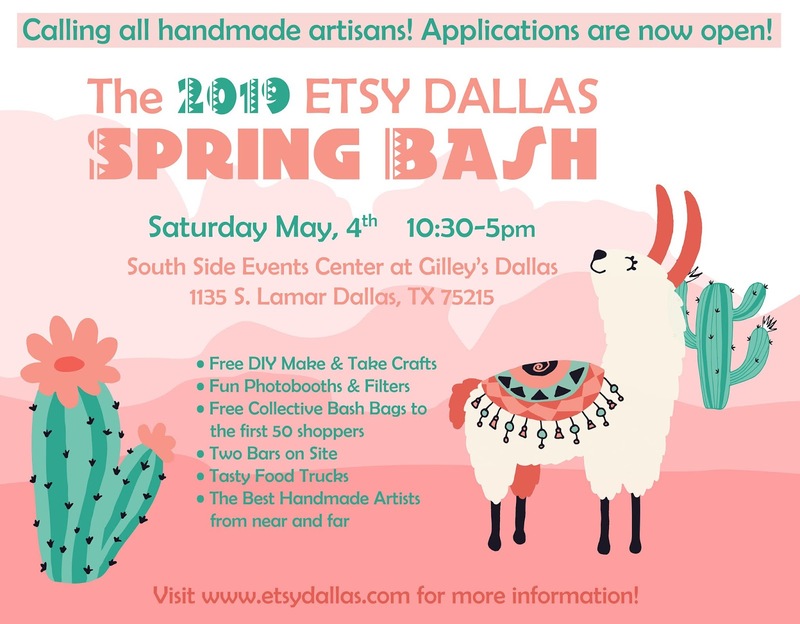 Hand-picked artists, crafters and designers from near and far gather at the Spring Bash for one-of-a-kind one-stop shopping. Admission is FREE and kids and strollers are welcome! Get there early if you want to be one of the first 50 shoppers to snag one of our coveted Bash Bags filled with swag from our talented vendors!" Applications are available here and are due by February 27th, 2019. For more information, visit their website, facebook page or contact their event coordinator at etsydallas@gmail.com. "A family friendly event--Arts and Crafts, Food Vendors, Kids Zone, Carter Blood, fireworks show!" Booths are 10 X 10 and cost $65 until June 3rd and $80 after. Applications are available here and are due by June 24th, 2019. For more information, visit their website or contact their event coordinator at events@princetontx.us / 214-733-2521. “Join us on April 27, 2019, from 9 a.m. thru 5 p.m. to shop for your favorite Mother’s Day gifts, birthday gifts, and even graduation gifts. Or, maybe even something special for yourself. You’ll find many hand-made items as well as cosmetics, scents, etc. This is our sixth Craft Fair in 3 years, and we have had many returning vendors. You’ll notice the hours this Spring have been extended as they were in the Fall from 5 hours to 8 hours, giving you all day to shop! We look forward to seeing you there!" Booths are one table and 2 chairs for $50. Add $5 if electricity is needed. Applications are available here and are due by April 15, 2019. For more information, contact event coordinator, Amanda, at amanda_rachal@yahoo.com or Kim at Kimberly.harkey@yahoo.com. "Art + Crafted Roadshow! is a two day FUN & FABULOUS shopping extravaganza featuring America's Artists, Artisans, + Creative Souls, Designers + Makers! Showcasing an eclectic blend of handcrafted one of a kind items, artisan designs, home décor & more!" For more information, visit their website or contact their event coordinator at cscougarbandcraftshow@gmail.com / 254-230-3487. "This is a premier event for the Junior League of Richardson. We will have unique vendors selling a variety of products. " Booths are 8 X 10 and cost $250. This fee includes 6’ table and 2 chairs. Applications are available here and are due by March 1st, 2019. "Local Crafters & Direct Sales. Giveaways and more"
"Indoor Handmade, Boutique, & Vendor Event. Live Music, Food Truck, FREE to Attend, FREE Parking." For more information, visit their website or contact their event coordinator at parentsoffaithschool@yahoo.com. "A fun, family-friendly day of food and shopping. More than 100 vendors will be there featuring home décor, clothing, accessories, skincare and more!" All booths are indoor. Tables and chairs NOT included. Electricity $10 (limited availability). Applications are available here and are due by March 06, 2019.